All Malawi cichlids hail from Lake Malawi in Africa. Lake Malawi is found in the eastern part of the continent and is divided between three African countries: Malawi, Mozambique and Tanzania. Depending on local dialects, Lake Malawi is also known as Lake Niassa, Lake Nyasa and Lake Nyassa. An older name for Lake Malawi is Livingstone's Lake. It is a relatively large lake; 75 m wide at the widest point with a total length of 560 km. The total surface area is close to 30,000 square kilometres. Lake Malawi has one major tributary, the Ruhuhu, while the Shire River is the lake's largest outlet. During Lake Malawi's 40,000 year long history a rich fauna has developed in the lake. A lot of the fish species are cichlids that have developed to fit different ecological niches. Another famous member of the Lake Malawi fauna is the Chambo fish, a large fresh water perch. Lake Malawi is famous among aquarists since the lake is a large contributor of beautiful and fascinating fish species suitable for aquariums, such as the Malawi cichlids. The fish in Lake Malawi is also very important for the local habitants, since a large part of the people living around Lake Malawi get their food and income from the lake. Malawi cichlids are divided into two major groups: Mbuna cichlids and Peacock cichlids. The word Mbuna is pronounced “umboona” and means rock-living in one of the local languages spoken around Lake Malawi. Mbuna cichlids live in rocky regions, particularly in the shallow waters that are found along the shores of the lake, and around the islands. Naturally, a majority of the Mbuna cichlids are cave-breeders. Among the reasons behind their popularity as aquarium species are their striking colours and intriguing behaviours. Mbuna species are also smaller than many other cichlids which make them easier to house. Stripes and bars are common patterns on Mbuna cichlids, and the colours are often pastel and extraordinary vivid. Both male and female Mbuna cichlids display striking colours, but the male is typically even more dramatically coloured than the female. If you keep female Mbuna cichlids in your aquarium without any male Mbuna cichlid, they dominant female Mbuna cichlids can develop more vivid colours and look more like a male Mbuna. A submissive male Mbuna can also dampen his colours and look more like a female Mbuna if you keep more than one male Mbuna. Keeping male Mbuna cichlids together is however unadvisable, since they will fight a lot to establish which one is dominant. A very large aquarium can sometime house two male Mbuna cichlids, but you need to decorate it in a way that makes it possible for the males to establish their own territories and stay out of each others sight. Mbuna cichlids are not schooling fish, but you can see large groups of Mbuna cichlids in Lake Malawi. A majority of the Mbuna cichlids are herbivores, but they like to supplement their algae diet with insects, tiny snails and such. The herbivore Mbuna cichlids have elongated intestines that make it possible for them to extract protein and carbohydrates from algae. There are also a few carnivore or omnivore Mbuna cichlids, such as the species in the genus Labidochromis. Unlike the Mbuna cichlids, the Peacock cichlids inhabit open water areas in Lake Malawi. Peacocks are much more gentle and less aggressive than Mbuna cichlids, and should not be kept in the same aquarium as Mbuna. They hardly ever encounter each other in the wild, since they live in totally different regions of Lake Malawi. They also have different feeding habits. Peacock cichlids are typically carnivores; or more specifically piscivore since they prefer to hunt other small cichlids. There are also some Peacock cichlids, like the Copadichromis, that eats zooplankton. The Peacock cichlids have gotten their name from the vivid colouration displayed by the male Peacock cichlids. The female Peacock cichlids display a much duller colouration which allows them to stay camouflaged. As mentioned above, the Peacock cichlids are not as aggressive as the Mbuna cichlids. They will however claim territories and can be quite violent within their own territory. Peacock cichlids will usually reach a size of 10-15 cm (4-6 inches). 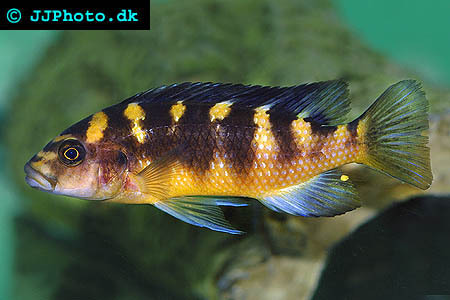 The Peacock cichlid is an ovophile mouthbrooders, i.e. it guards and care for the eggs by caring them inside its mouth. The Peacock cichlids are frequently referred to as Haplochromine cichlids or simply “Haps”. This has to do with the scientific history of the Peacock cichlids. The genus Haplochromine was once used for the Peacock species. Today, no Peacock cichlids belong to the genus Haplochromine. A majority of them are instead counted to the genus Aulonocara.